The new station (seen at the festive opening in the photo) provides a much needed connection for those trying to get back and forth between downtown Naples and the upper reaches of the city on the Vomero hill. On the graphic, above, the yellow segmented line and stations are under construction and should be up and running by, oh, sometime in 20-&-something. 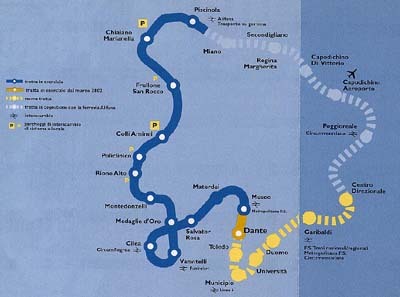 The light blue segmented line and stations are projected (with no reliable, predicted date of completion as of this writing --June 2004) and will complete the giant metro-ring around Naples.